Today we rescued many a stressed-looking man by opening our doors on a Sunday, therefore providing the opportunity for an extra few precious hours of panic buying. It worked out well, resulting in the sale of a fair few books and gift certificates, as well as crafts from Claire’s Beautiful Things. It wasn’t just the fact that I had what she was looking for, but the lovely story that she told. 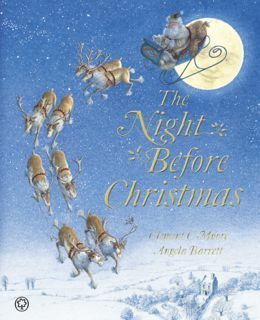 Every year her mum reads ‘Twas the Night Before Christmas to herself and her sister, but this is the first year in England without her mum, so the book is for our lovely customer’s husband to read on Christmas night. Everyone that I have relayed this episode to has had the same ‘aah’ response, so I decided to share it with you! If I don’t say it in person or before hand, I’d like to take this opportunity to wish everyone a very Merry Christmas and (even more importantly), a peaceful New Year. Previous Post Christmas has come early! Next Post Here’s to 2013!